Loc: Fall River MIlls Ca. Well, it has been a cold winter, rainy and windy, but despite this the LOOOOOOOONG overdue 70 inch telescope build has begun. 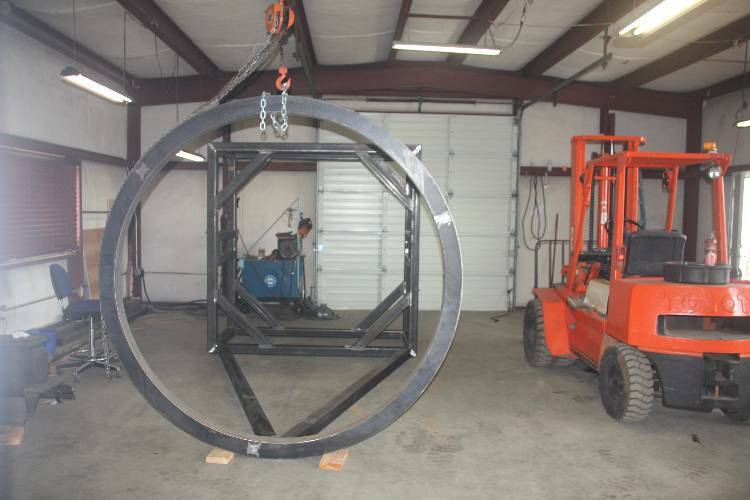 The first part to be constructed is the "tube assembly". It is only about 1/2 way together at this point but I thought you all would like to see a few pictures of the construction process. At this point there are still several diagonal brace sections to be added to the "mirror box" . 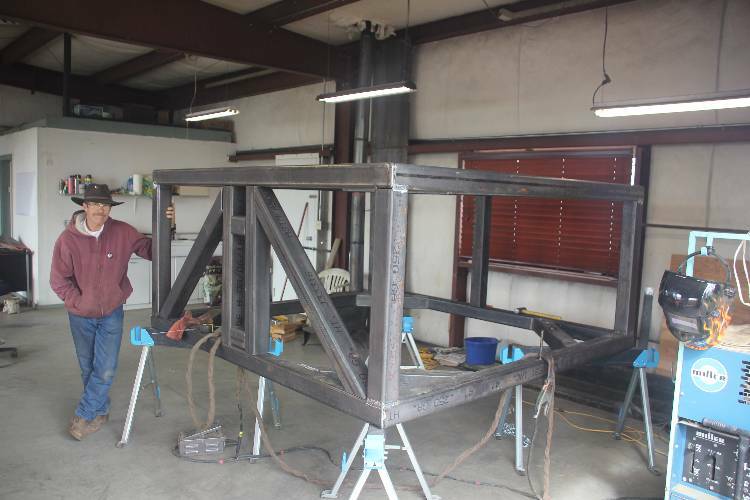 The front ring and truss section on the floor are just in place for mock up. Hopefully the mirror box section will be "finished" by the middle of April so it can go to a shop for the needed "machining applied where necessary". 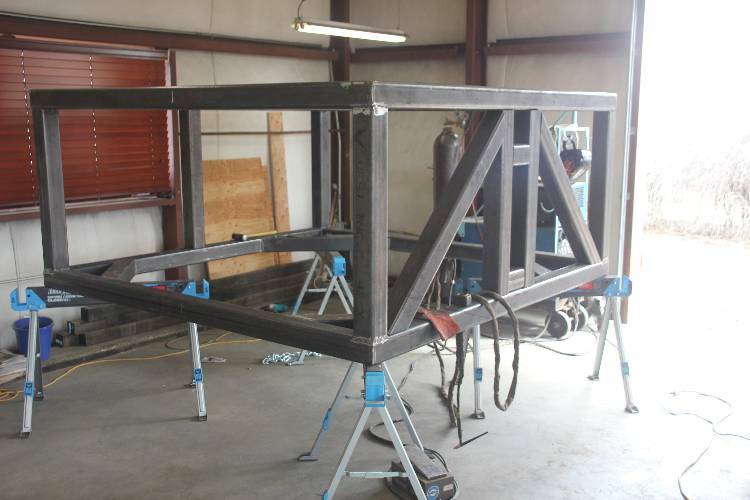 After that the front truss assemblies and ring will be added. So here are a few picts. Please keep in mind this is a work in progress. I can tell you all that at times this project scares the *@#& out of me. My wife Debra (this is her fault) keeps saying just one weld at a time, just one weld at a time, breath!! We are estimating this build to be a two year process. Updates will come when they come. (every few months? hopefully). So I hope you all will walk with us and enjoy the journey. A very cool project!!! We will be excitedly waiting updates. What is the optical design plan? What is the final location, observing program and etc??? WOW. Please fill us in on the optical design features. And who will make your mirrors? Sorry for the screen shot. The primary is a f/3 and the light path will be folded back on itself to bring the focal plane to a point above the mirror. Primarily this instrument will be used for imaging. However a few of us have developed brain tumors (inside joke) and think we may be able to image transfer the focal plane out through one of the altitude bearings. Still in discussion. The planned prime focus will provide a 1/2 degree field using a 2k x 2k 24 micron ccd camera. Planned use runs the whole spectrum. My own personal interest is galaxies so this instrument will finally give me image scale and speed, a potent combo. Others have suggested exoplanet work, spectroscopy, asteroid work, public education, this list is long. The location is the subject of much discussion at the board meetings so is still up in the air. The mirrors were made by members of Group 70. For some of the people involved this was their first mirror grinding project. The primary fabrication team was lead by Dave Barosso. 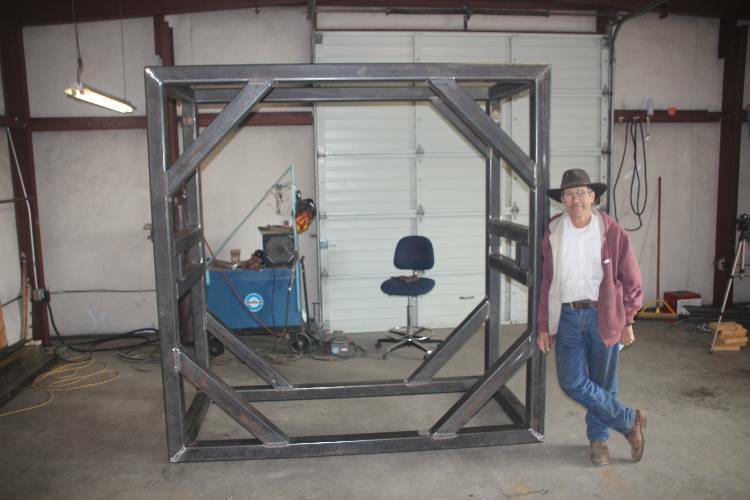 He is a long time member and instructor at the Chabot Telescope Makers Workshop. Others like Cloudy Night's Oregonraybender ( a long time friend) have been consulting on things like the image transfer design to try for visual use. So we are drawing from a large community of amateur and professional peoples. Keep in mind this is not "cutting edge tech". It is basically battleship tech. We joke about it being a "grab and go" telescope. Just grab it with the forklift and go! Edited by gnabgib, 21 March 2019 - 11:44 AM. An incredible project. Sooooo interested to follow this ! Love the front ring! How was that made? I understand it's (wisely) an alt-az mount. Any details on the design? 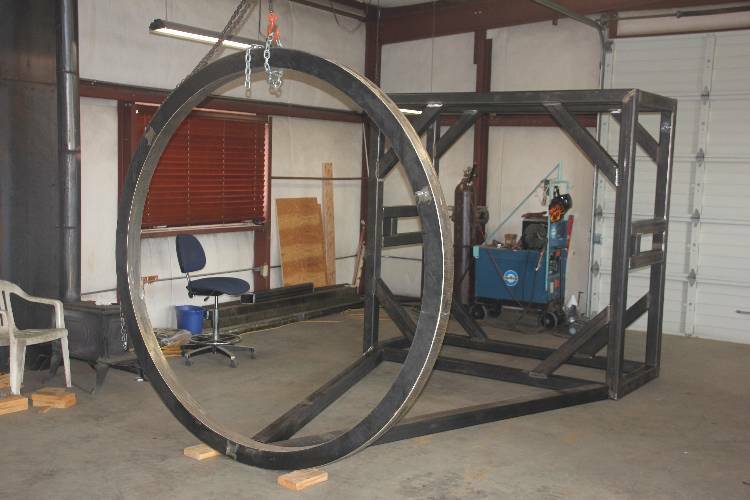 The front ring was fabricated at Bulling Metal Works, San Leandro, Ca. Walter Bulling who is my former boss used a laser cutting machine to cut 4 steel arcs that are 1/4 inch thick for the faces and then rolled 1/4 inch plate for the inside and outside surfaces. Much welding later a beautiful ring was made. After many measurements I doubt there is a 1/8 inch diameter difference anywhere. It truly is a work of art. It's not solid but is a box cross section. Weights about 250 pounds. As far as using visually just climb in with a magnifying glass and have fun! You are correct although I fought for an equatorial fork design. Currently the overall design concept exists manly as sketches. However we have a good direction set and are fleshing out these bones as we go along. The basic fork will have uneven length arms with one side supporting a 6 inch pillow block type double roller bearing and the shorter arm will support a 48 inch drive disk on 2 rollers. This disk forms a roller drive to control the altitude axis. which in turn sits on a triangular box steel frame supported by three concrete columns or piers. Again not trying to reinvent the wheel the turret bearing was suggested by one of our consulting engineers. Having used them on similar sized telescope installations. They are very cost effective. A 40 inch bearing is around $5k. Yes a chair bolted just behind the focal point has been proposed. We will be hosting an open house for this years GSSP attendees. Rod you will have to see this for yourself. Great work Kevin. Remember we started with the 22 inch tube, then 30 inch, both made in the Humphrey Instrument's machine shop on a Saturday. We were just able to get 30 inch through the door. So this one is just a larger scale. You got this. 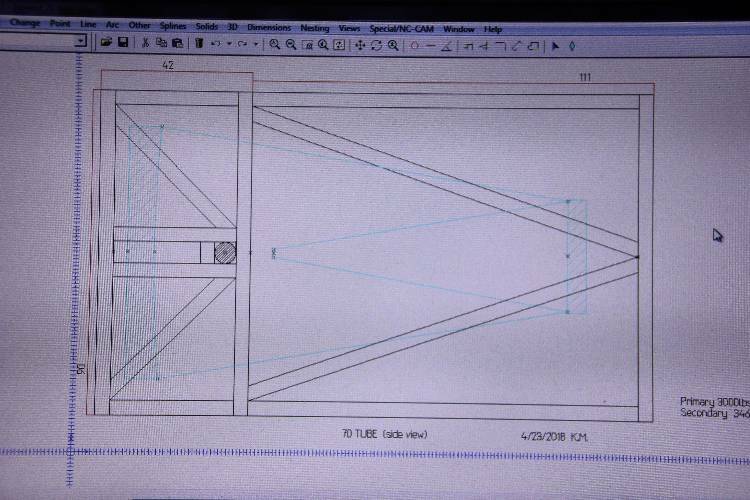 If you are able to send me numbers, I can do a rough design of the relay optics. I have a few other designers who are willing to review it. So a simple layout is fine. You have the support of many who can't wait until the scope is ready, no pressure. Debra can send you hot coco and shoulder rub if needed. That would be one heck of a fork! I'd be tempted to use a Palomar type horseshoe mount. It would be very strong and stable, permit a large RA ring, and avoid the field rotation of an Alt/Az mount, but of course has a significantly bigger footprint. Seems easier to me than dealing with a field de-rotator for AP, but you folks have put way more thought into it than me. One heck of a fork indeed! The fork on Chabot,s 36 Cass weighs in around 6000lbs. But it is rock solid. At 700x the wind does not bother it at all. Alt/az solves many construction issues like the mirror edge suppport is just a sling, Housing the scope is simplified, so dealing with field rotation is minor compared to everything else. If you look around at the small professional scopes , say 40 to 120 inches, most are on fork mounts. Ah the good old days!! After a lot of input the board choose alt/az because it is more achievable by a band of ATM's and there are control systems available at modest cost to run this type of scope. Great to see progress!!! Having been a member back in the 90s, I checked your page out a few years ago and assumed the project was de facto defunct. Is there a site selected for the telescope? Awesome project!! With regards to tracking, would a giant equatorial platform be out of the question? back in the 90s, I checked your page out a few years ago and assumed the project was de facto defunct. Is there a site selected for the telescope? Site selection is an ongoing discussion. Since construction will take about 2 years (it is volunteer work) we have time. Since many modern scopes are alt/az there are a few choices available for control. The field rotation is not the problem it once was. Also consider that the base of the fork to the center of the alt axis is around 7 feet you do not want to be tipping it to far! Personally I love equatorial platforms. They are quintisential essence of the split ring mount. Just not as practical on this scale. Is this the same Group 70 mirror that was found decades ago? Are the original members of the group still working on it? I need to look this up when I get some time, it's been a while. This is real news! This is the same mirror blank that was found years ago. I don't want to think how long it has been. The membership shaped the raw blank, ground and polished into a prabola, crated it and there it sat for many years. About three years ago Dave Barosso who headed up the mirror team breathed new life into the project. So here we are. By the wAy Dave is 70! The joke at the shop is Group 70 stands for the average age of the membership! In reality we just needed to grow up a little. Life, families, and jobs can sidetrack projects! Yep, that spells it out, it should the "70 year old Group", hic. with the mirror diameter. You become a member by being that old! We are all getting there fast. Dave did CPR on the mirror, "It's alive, it's alive!" The mirror itself is even older, wasn't it found in Tasmania before WW2? I need to scour old S&T's to refresh my memory on this project. Glad to see you guys are keeping it moving along! I am not sure of the dates but we believe the mirror blank was one of two cast for the 48 inch schmidt camera . With the successful completion of the schmidt camera the second blank was in storage for several years when Dr.Theodore Dunham Jr. who I believe was with Palomar Observatories acquired it. It was shipped to Hobart, Tasmania where Dr. Dunham planned to build a large southern observatory. He managed to build a 40 inch telescope but the 70 inch also languished due to lack of funds. This "blank" was not the edged, ground, and generated blanks we see today. When we brought it back to the states and un-crated it the impressions of the firebricks used to make the mold were clearly visible. It was very rough. If I remember correctly it took over 2 months to edge it round using a diamond cup wheel on a 1 hp motor. The back was then ground flat using a steel manhole cover (don't ask!) and starting with 40 grit. The first few strokes over that rough surface were nerve racking. But we prevailed. Finally after several months the blank was flipped over and the optical work began. The curve molded in the blank required removing about 3/4 inch from the edge to achieve the desired radius. When washing off a 70 inch f/3 mirror it takes a while to "fill it up" with water. By the way before any work began we first had to build a grinding machine. This mirror is like a cat. It seems to have "many lives". Shipping it back from Tasmania was straight forward except for the "dock strike" that delayed shipping several weeks. When it got to San Francisco the import paperwork was straightforward except the paperwork got lost and required a bit of back-stepping to complete. Finally it was released so we drove over to the port of San Frisco with a truck to pick it up. The trip home took us across the bay bridge to Oakland, Ca. This was 2 days before the Loma Prieta earthquake took out the bridge. A charmed life? This was in 1989. If anyone has the Sky and Tel issues for 1988 perhaps you could find the original ad offering this blank for sale.